Radio France Internationale: UN, new prime minister, new cabinet – new hope for Somalia? There are reports that a US drone strike in Somalia at the weekend was targeting the leader of al-Shabaab. Ahmed Abdi Godane was reportedly in the vicinity of the drone attack, but he was not killed. This comes as the Somali president, Hassan Sheikh Mohamud, attends the African Union summit in Addis Ababa. RFI’s Daniel Finnan spoke to the Somali president about the fight against al-Shabaab, domestic politics and his country’s relationship with Kenya. 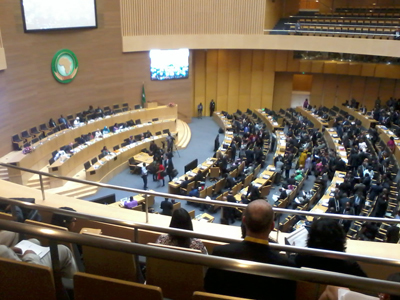 Kenyan Foreign Affairs Minister Amina Mohamed speaking about South Sudan ceasefire monitoring following an Intergovernmental Authority on Development (IGAD) meeting at the African Union summit in Addis Ababa on Friday.